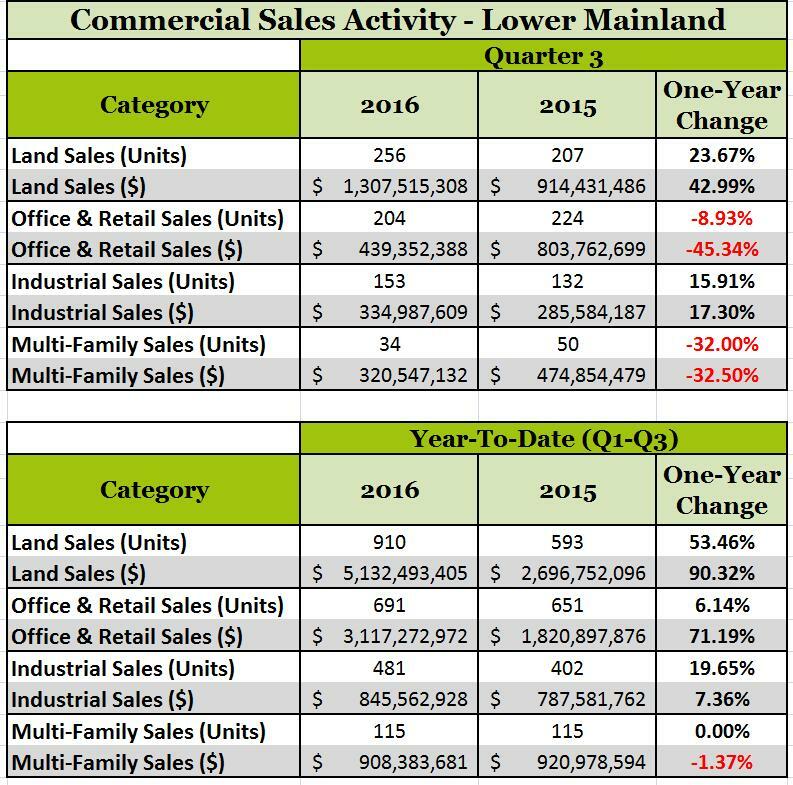 Below you will find the commercial sales activity broken down by category for the Lower Mainland for Quarter 3 of 2016 and 2015 and the relevant percentage change. As well, there is a year-to-date comparison which encompasses the first three quarters. Quarter 4 statistics should be released in the next few weeks! The statistics for the Lower Mainland are inclusive of the following 18 cities: Abbotsford, Burnaby, Chilliwack, Coquitlam, Delta, Langley, Maple Ridge, Mission, New Westminster, North Vancouver, Pitt Meadows, Port Coquitlam, Port Moody, Richmond, Surrey, Vancouver, West Vancouver and White Rock. 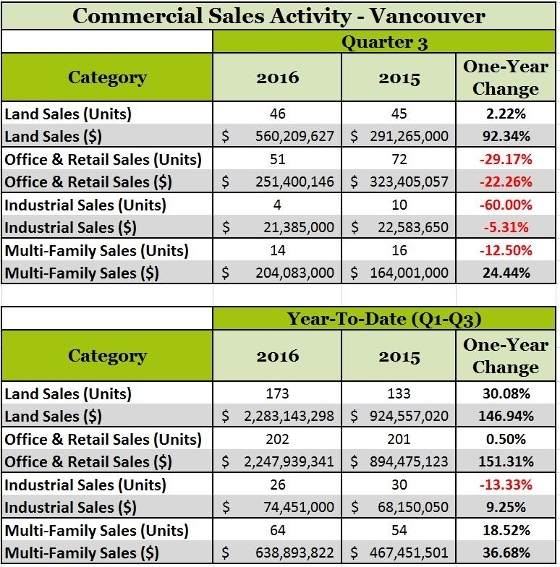 Thus, the first table is not representative of only Vancouver commercial real estate (a separate table will break down the statistics for Vancouver). Below you will find information from the above table which has the Vancouver data extracted from it. While the Quarter 3 results year over year have primarily seen a decrease in both unit sales and sales dollars, the year-to-date figures show a different story. All four categories see an increase in sales dollars when comparing 2015 to 2016. In addition to residential real estate and property management, we also do commercial real estate here at WeSellVancouver. We'd love to help you with your next investment or business venture. Contact the WSV Real Estate Services office at 604-801-6654 or at info@wesellvancouver.ca for all your real estate needs.